The fire appeared to have started in a storage garage on the site. It blew out a window and began burning a rental unit. No one was hurt. Everyone on site evacuated. Fire crews had the fire under control in about 20 minutes. 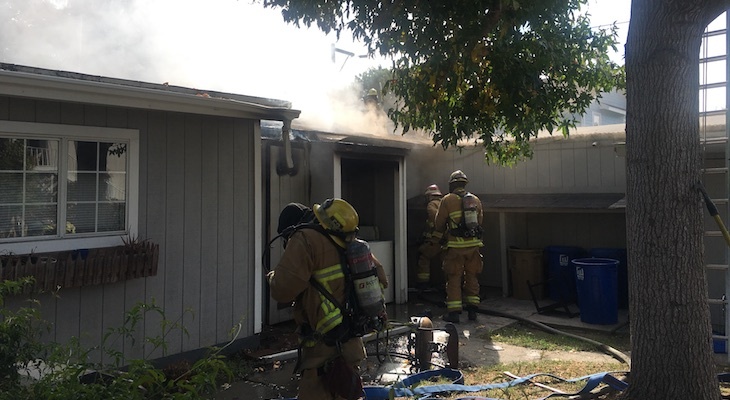 Firefighters responded to a small house fire in the 700 block of De la Vina and quickly extinguished flames coming from the back of the home. De la Vina was blocked from Canon Perdido to Cota for about 2 hours as 3 engine teams secured the area and searched for the origin of the fire. No one was hurt in the blaze and damage was confined to one room of the old Victorian house that had been split into 5 units. No estimate was given as to when the residents would be allowed to re-enter the dwelling. Report of a structure fire with a hazmat response to the 700 Block of De La Vina. From the Lower Riviera I could see the smoke. I pointed it out to a friend of mine who was so focused on something else, he didn't even look up when I said, "Hey. Is that smoke? Looks like a fire, maybe?" Thanks for the reports on this. I was curious to know what it was that happened. Maybe 2 seprate fires..711 De La Vina then I heard of a fire in the 700 Block of Bath street there was also a fire in the 2300 Block of Bath street all around the same time. There's a fire in the 500 block of Bath Street. Is this related or was the address wrong? Initial reports of the Bath Street fire were incorrect. It's the same as the De La Vina fire. I did not hear the whole call so if someone has more info please share..